This isn’t really my kind of movie. I never saw the previous ones, and I am probably the only one in the world who hasn’t. But sure, this all-female cast is alluring, and surely anything with Cate Blanchett in it is worth my time, so, yeah I went ahead and played and saw ‘Ocean’s 8.’ And I didn’t die from watching it. Ultimately, I was underwhelmed. I expected glitz, glamour, over-the-top production. It didn’t deliver that. This could have been much better. I think it would have benefitted from a female or gay point of view. For example, I think it would have been great if the ladies’ wardrobes reflected their characters more – I am imagining Rhianna’s Island wardrobe, for example. And the screenplay could have used some tightening. I was expecting non-stop action instead of the press and play pace we have here. All in all, it wasn’t a total disappointment, but ultimately unmemorable. 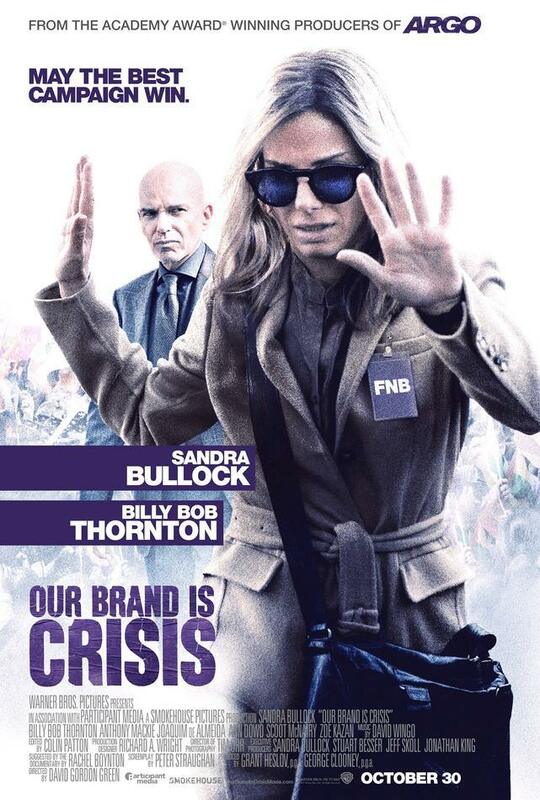 It’s very disheartening to find out that “Our Brand Is Crisis” did so poorly at the box office that it has become Sandra Bullock’s lowest opening-weekend movie in history. This is far from her worst movie, it just failed to achieve its potential. And it is kind of a hard sell, with a title that’s a little confusing. It stars Bullock as Jane Bodine, a political strategist hired by a Bolivian incumbent candidate who is struggling to retain power. The movie is based on a true story, and from a documentary of the same title, which chronicled that campaign. (Bullock changed the real life character from a man to a woman) I thought the movie was fairly entertaining, and is exactly what you get from a Sandra Bullock movie – her fans would enjoy her here. But the plot may be a bit too complicated for middle America (I read an article in Hollywood Reporter that people in the middle states had problem with the accents, which is baffling since they really weren’t hard to understand) The movie makes you think, of how we elect our public officials, and that everything is now based on marketing a “message” instead of real political discourse. Nothing new, of course, but still, this movie aims to say something important, which makes it even sadder that few are getting that message.